Thank you to Punoc Juna from Foundacioni Nehemia School for this drawing to represent their young people. Here we have children from all different Nationalities surrounding the World in Peace. We also thank Luiza Elmasllari for having the children of Foundacioni Nehemia school join in this project. The Nehemia Foundation is involved with some great work in Albania and has overcome many challenges over the past 20 years. NEHEMIA School started its activity in 1998 with only five classes and now its activity extends to 290 pupils in total. 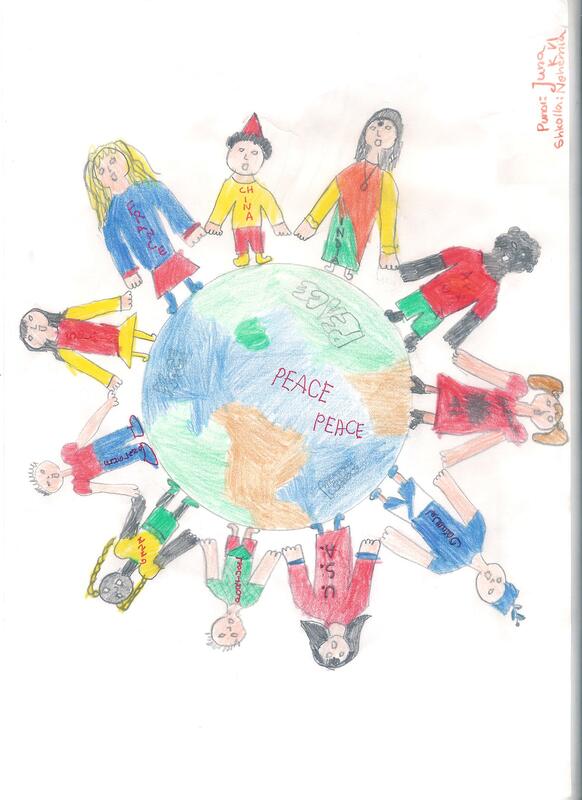 We thank Foundacioni Nehemia School in Albania for beginning the Circle of Peace activities around the World for Peace Day September 21st,2012. “Yesterday, on the International Peace Day, as you suggested, I organised the pupils and teachers of our school, at noon, and asked each of them to say a prayer for peace . I am sending you 2 photos.We are always ready to cooperate with you in such wonderful peace promoting projects. Copyright © 2012 PeaceQuilt, All rights reserved.